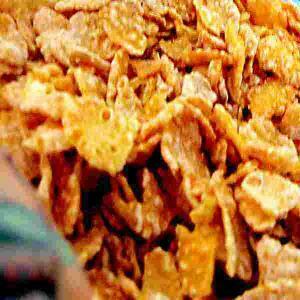 Cereal is one of my favorite breakfast foods, and I’ve always loved Raisin Bran. Even as a kid, Raisin Bran was definitely in the rotation on the cereals I would look for in the cupboard, and my taste for it has stuck with me all throughout the years. One thing that has changed, though, is my enjoyment of sugar. Back when I was a kid, Golden Grahams was my all time favorite and so I’d have that occasionally, until recently when I was eating it and realized that it was, well, absolutely disgusting to me now. I love sugary treats, but for breakfast, it just doesn’t work for me anymore. Even Raisin Bran, in it’s original form as packaged by cereal makers like Kellogg or Post, is too sweet for the simple reason that they put sugar on their raisins. I guess they figure that people aren’t going to eat those pesky healthy raisins if they aren’t sweetened somehow. So, I’ve started making my own raisin bran and I have to tell you, I LOVE IT. Now I don’t measure. I just pour some bran flakes into the bowl, throw in a small handful of raisins, stir it around, then pour in some milk, and voila, homemade Raisin Bran! It’s delicious. It’s not too sweet. And it’s cheap! A 17.3 ounce box of cereal is around $1.99 (maybe less) and lasts a couple of weeks. A two pack box of raisins is around $9 and one bag lasts for weeks. A few ounce of skim milk costs pennies. So, while I’m not sure the exact price per bowl, I know that it’s a heck of lot cheaper than buying the pre-packaged Raisin Bran that is loaded with sugar that I no longer enjoy. All in all, it’s a pretty ‘sweet’ way to start off the day, wouldn’t you say? Readers, what do you enjoy for breakfast? Have you done anything to make your breakfast healthier, cheaper, or both? Please let me know in the comments below. Now I Can Love Over 100 Libraries! I love Overnight Oats – I recently priced up the cheapest possible version and got it down to 9.6p per portion, but I tend to jazz up a bit with some foraged berries at this time of year and some chia seeds (which are still insanely cheap). Have a look at my recipe! Love this idea!!! We generally avoid cereal due to all the added chemicals (and the higher amount of cash we end up spending on milk – we only buy organic) but I would totally try this for our kids. Great idea! Thanks, glad it proved a little useful. I stopped eating cereal for a while, but I still like having in the house as a snack. One of my favorites is multi-grain cheerios. I love the slightly sweetened o’s. This is a great idea for getting what you want and keeping the costs down. I’ve started making homemade bread (nothing like homemade bread toast) for only $0.50 a loaf. Lately, my 2 year old has been into oatmeal for breakfast. Quick oats with water and a bit of brown sugar. Nothing fancy but way cheaper than the individual packages!